Listen, Do You Want To Know a Secret? The truth has finally emerged, as truthy as truth can be. Finally, the Communist Master Music Plan has been exposed. Time has proven that the "artificial" neurosis of 1960s American youth was no more artificial than our sacred right to bear arms and die with a handgun to be pried from our cold, rigid digits. Baby Boomers are genuinely neurotic. Not our Boomers, of course, just Lefty Boomers. Underground laboratories hidden beneath remote dales and bucolic glens throughout our fair land have discovered that the Beatles' classic love song, Michelle, when played backwards and slowed down, is an ukase straight out of Red Square and the Kremlin that commands its listeners to, "Kill pigs, bad pigs, ils sont des porcs bien connu comme étant prigs, oui ces porcs." It's an all-out assault on liberty and the American way of life. That French is superciliously recited with airy pretension and an English word thrown in for a cheap rhyme makes this threat even more insidious. We bailed the Frogs out of WWI and II and now they're killing us with French fries and conspiring with The Fab Four and the Comintern to rob our youth of their precious essence. D'gall! It's enough to drive all true, red-blooded Americans to purge themselves of godless hemoglobin so that only pure, white blood cells flow through our veins. Who stands up for our children when they lie down to diabolical foreign influence and are ruthlessly trod upon by Marx and his brothers, Lenin, Stalin, and Zeppo? I read the news today, oh boy. The Beatles were actually born in Kenya and raised to worship Baal. As if we didn't know. NOEBEL, David A. 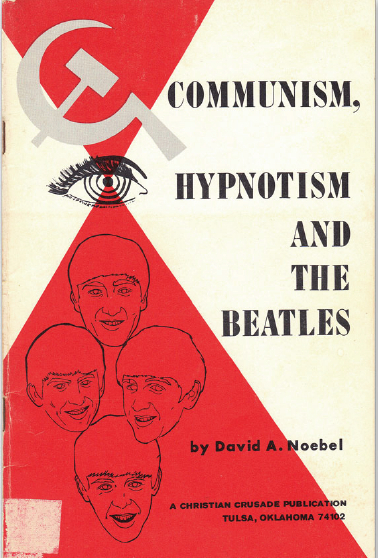 Communism, Hypnotism and the Beatles: An Analysis of the Communist Use of Music - The Communist Master Music Plan. Tulsa: Christian Crusade Publications, 1965. Revised Third Edition. Octavo. Staple-bound illustrated wrappers. 26 pp. This book went into not just three editions but, so popular, it went into five editions through 1965, winning that year's Noebel Prize for Litterature.